Ashley Valley was a Guard for the UConn Huskies from 2001 – 2005. Some team highlights of Ashley’s UConn career were winning three National Championships, two Big East Tournaments, and a 39 win and 0 loss season. 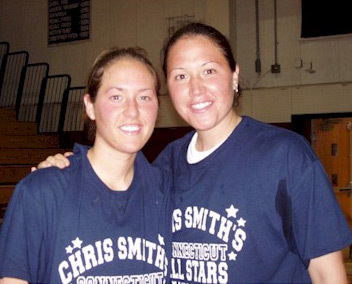 I spoke to Ashley in July 2006, as she reflected on her basketball memories and experiences. Ashley grew up in Colchester, Vermont, and has been playing basketball for as long as she can remember. Her dad coached a boys’ team when Ashley was very young so Ashley, and her sister Morgan learned the game while spending a lot of time at their dad’s practices. Ashley went to Mater Christi Catholic Junior High School in Burlington, Vermont. They had no basketball team so she played on the boys Athletic Amateur Union basketball team. When she arrived at Rice Memorial High School in Vermont, Ashley became a member of the varsity basketball team as a freshman. During her sophomore, junior and senior years, the team won the Vermont State Championship, an accomplishment that’s an honor if ever reached once during high school. Ashley was Gatorade and USA Today Vermont Player of the year, and she holds the records for most points scored in a quarter and most steals in a season.